Take CALA-Q to support a healthy heart and healthy vision. CALA-Q's formula contains Calamari Marine Oils, L-Carnitine Fumarate, Coenzyme Q10, Vitamin E, Vitamin B6 (Pyridoxal-5-Phosphate), Folic Acid and Vitamin B12 (Methylcobalamin). Calamari oil, an alternative to fish oil, comes from South American calamari (squid) that are sustainably harvested and an eco-friendly source of omega-3 fatty acids with more DHA than fish oil. Calamari oil is more stable than traditional fish oils, making it less prone to rancidity. Also, calamari oil does not cause the fish aftertaste or unpleasant "repeating" that is common with fish oil supplements. DHA is superior for lowering high blood pressure and it is more potent at supporting circulation. If you care about the environment, Calamari oil is your best choice as it comes from deep-water, spawns quickly, multiplies fast and does not have the same issues with heavy metals like mercury that fish do. 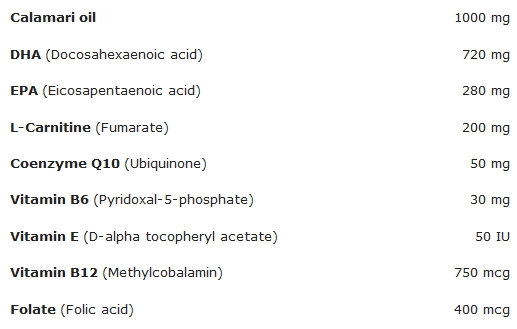 Coenzyme Q10 is found in almost every cell in the body. CALA-Q provides triple support for lowering blood pressure with the Calamari oil, CoQ10 and the additional B vitamins. Coenzyme Q10 has also been used to treat gum disease, which is linked to poor heart health. 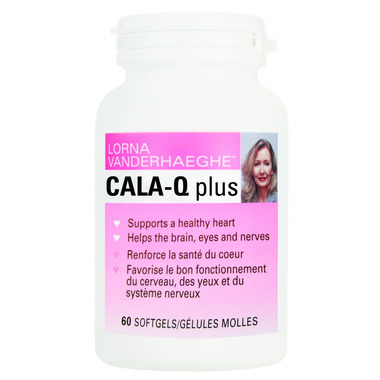 CALA-Q Plus contains a highly absorbable form of Q10. Vitamin E, when combined with coenzyme Q10, keeps the "bad" LDL cholesterol from clogging up your arteries. Vitamin E is important in the prevention and treatment of heart disease, cancer, Alzheimer's, menstrual pain, diabetes and rheumatoid arthritis. Vitamin B6 is required for over 60 actions in the body including a healthy brain. Vitamin B6 helps the body make hormones such as serotonin and melatonin that influence mood and sleeping patterns. Symptoms of low vitamin B6 include muscle weakness, nervousness, irritability, depression, difficulty concentrating, and short-term memory loss. Methylcobalamin is the most absorbable form of vitamin B12. Seniors, vegetarians, vegans, and people with digestive issues and/or absorption problems are at particular risk of vitamin B12 deficiency. Vitamin B12 is used to treat pernicious anemia, heart disease, age-related macular degeneration and fatigue. Low vitamin B12 can cause fatigue, shortness of breath, nervousness, tingling in the extremities and numbness. Suggested Usage: Take Two softgels once per day with food or as directed by a health care professional. Encapsulated in gelatin, glycerine, roasted carob powder, sunflower lecithin, beeswax and purified water. This product does not contain artificial colours or sweeteners, dairy, soy, corn, wheat or yeast. GLUTEN-FREE. Great product, only thing is they recommend taking 4 a day which can get costly so I downed it to 3 a day and found my blood pressure is normal now.